A nutritionist is advocating for us to eat like a baby in a new diet. The most ridiculous diet we've heard yet. And we've heard a lot. You’ll be as horrified as we were. Thrown common sense out the window in anticipation of the holiday season. Crackers in readiness for the crackers. That’s the only explanation I can find for a headline like this. Your mind immediately creates a picture of grown women flinging spaghetti at the wall, slobbering over gummed up bits of cruskits. Guzzling litres of milk at a time and then demanding MORE BOT BOT NOW. The demand for baby chinos would go through the roof as we all swapped our daily caffeine fix for a $1.50 pot of froth and a marshmallow. Mashed banana with a side serving of an Arnott’s arrowroot? And just think about how handy those Thermomixes would be? All that pureeing, the carrot, the sweet potato. The problem is that this is a genuine recommendation from a nutritionist on a reputable US news program. 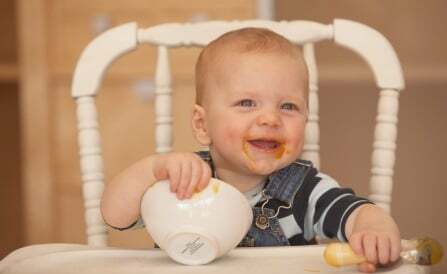 New York-based nutritionist Nicolette Pace told Good Morning America that babies have a natural rhythm when it comes to eating and that we, as adults, lose this at some point as we grow. There is some sense in her thinking. When did you last allow your two-year old to skip dinner in favour of a few Tim-tams and a cold glass of Sav Blanc? Who among us joins me in preparing nutritious healthy meals for our kids, only to pick at their leftovers instead of facing the sheer exhaustion that comes with cooking another meal? Me – I grab a large double shot skinny cappuccino after drop off and lick the chocolate from the lid in desperation. I’m actually not sure I can remember the last time I ate lunch and dinner that wasn&apos;t leftovers. I fuel my 3.20am till 10pm hours (yep you read that right) with caffeine and dark chocolate. The main message is to enjoy your food, like this little guy. So when you get past the ridiculous headline, you can see that some of what Nicolette Pace says makes sense. Her main concept is that eat when you are hungry (like toddlers) and eat well (feed yourself like you would feed your child). The slight concern is that many of us are simply too busy to read past the headline and could all very well think she is recommending we eat cheese sandwiches for a year, or smother all our food in tomato sauce. God help her if she ever met my son who, at the age of two would only eat pasta with butter, eggs, soft toast or a freddo frog. No fruit or vegetable in sight. Look, the one thing we know is that she isn’t recommending we start bulk buying Rafferty’s baby food, or that we all turn up to mothers group with adult sized servings of cut up avocado sandwiches (with crusts off) and halved grapes. The problem is for many mums, life is hard enough ensuring your children are well looked after nutritionally, and that your own diet naturally takes a backseat. For many women this can lead to problems – tiredness, weight gain (or loss) and an inability to cope with the day to day demands of being a Mum. So some of what she says makes sense, if you can ignore the bizarre reference to emulating a two-year-old. These are the good bits. Control portions and know what our stomachs can handle. A newborn&apos;s stomach is about the size of a cherry. It grows as they grow and by adulthood our stomachs are the size of a softball. It&apos;s important to take your time. Babies don&apos;t rush through their meals. They slow down and enjoy. Meals should last at least 15 minutes. Eat in intervals. Food is going to stay in your stomach for two to four hours. Take note ladies, no reference to upending plates of baked beans and certainly no recommendations for banana paddle pops. What do you think of this diet? Slightly crazy, or makes a teeny tiny bit of sense? We’re calling it… best birth announcement ever. Frozen sequel might not actually be happening after all.